Too distracted getting ready for this week's Cinevent to concentrate on writing, but wanted to have something up while I'm gone to the show, thus a handful of theatre ads recently scanned. Hope a lot of you will be at Columbus. It's a great show I've attended since 1982. How big a serial was Columbia's Superman? Well, not many chapter-plays merited newspaper ads like this. Back in the era of silent serials, lavish displays were commonplace on theatre pages, but that was when adults attended weekly installments. Talkies consigned these to kids and their Saturday matinees, where it mattered less what played as long as it could mount a horse. Superman, however, was always something special. Even if that 1948 serial disappointed, still it was the Man Of Steel and he had a following bigger with each passing year. I remember Kirk Alyn setting up his dealer's table at shows where few of us had even seen his Superman output, it having been decades since the two Columbia serials played anywhere other that in pages of Screen Thrills Illustrated. 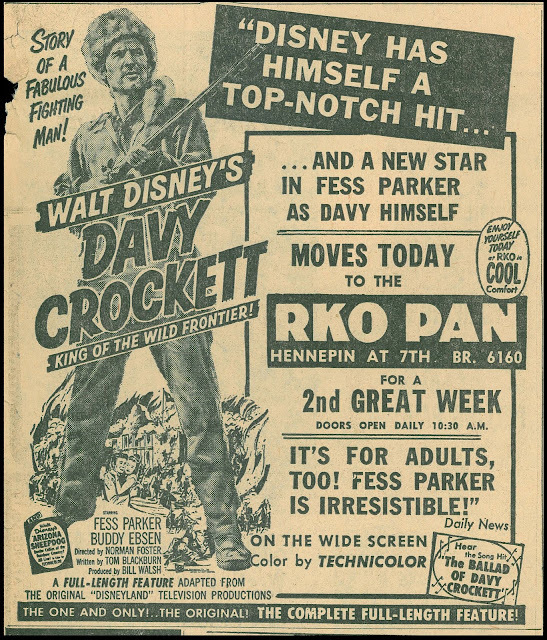 Were youngsters dismayed when they paid to see Davy Crockett and realized it was "adapted" from the Disneyland TV episodes? I'd guess color made up for letdown otherwise, along with seeing their hero on a large screen. Disney had been wise enough to shoot his Crockett adventures that way so as to secure residual value later when televisions graduated out of black-and-white. The craze over this character must have come as a shock to everyone involved. I'm too young to recall coonskin caps and such, and would probably have preferred cartoons anyway. The Mickey Mouse Club was usually a wait for whatever animated filler Mouseketeer Karen Pendleton pulled out of that drawer (she was my crush on the show and I was jealous at age five of Cubby getting to spend so much time around her). He Made Women Curse The Day They Were Born ... so this is dignified treatment Fritz Lang's M received when imported to US shores? Maybe art houses approached it with reverence, but grind situations knew there was much to exploit in the venerable German classic, and they weren't above using lowdown art to lure patrons in. Peter Lorre looks like he's strangling a Baby Jane doll here. Thank goodness no such scene was included in Lang's original. Lorre's designation as "lust-murderer" implies something even more disturbing than what the film depicts. 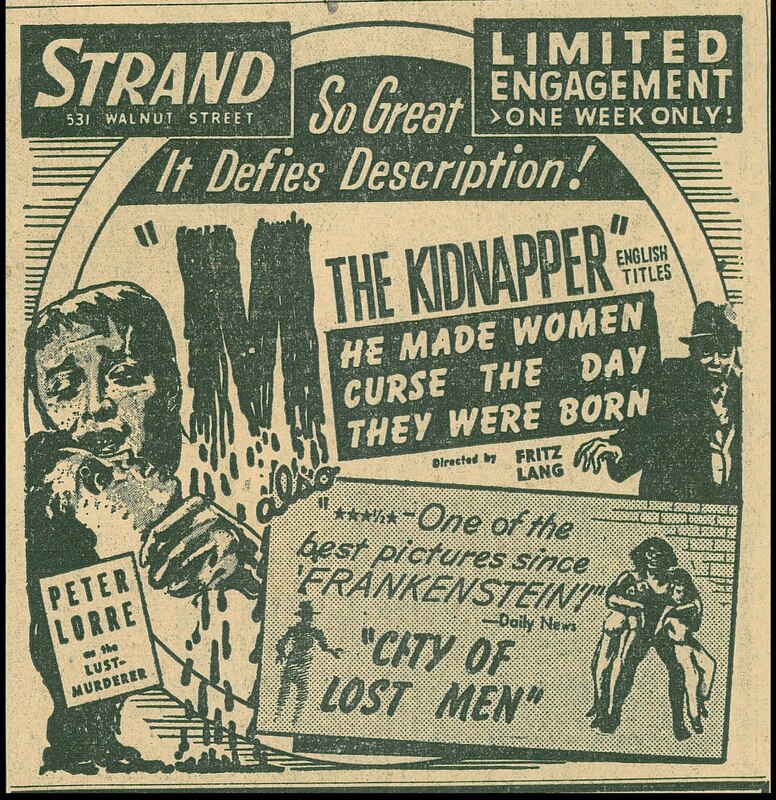 This ad dates from the forties, long before M was taken up by various churches of cinema. It's always interesting to come across ballyhoo for titles since canonized, wherein shlock merchandisers took what was rented them and really went to town with it. 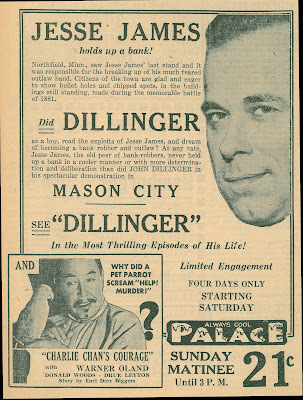 Folks in Mason City, Iowa evidently took quite a shine to badman John Dillinger after he robbed their First National Bank on March 13, 1934. This ad for newsreels featuring the desperado fairly celebrate Dillinger's determination and deliberation as he emptied their vaults after the cool manner of his suggested inspiration, Jesse James. Would these have been the sorts of downtrodden folk that covered for Bonnie and Clyde when they passed through? This ad looks for all the world to me like an endorsement of JD's taking ways. Depression- whipped citizenry must have really had it in for those banks! 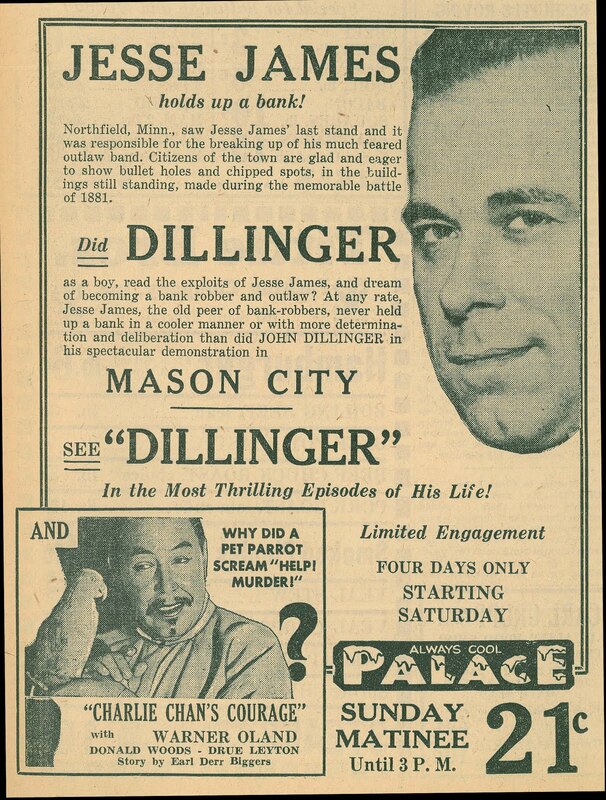 Wonder if they cheered footage of Dillinger when Movietone reels flashed him up. Must have been a kick having a bank knocked over right in your own home town (likely just a few doors up from Mason City's Palace Theatre). Incidental to the Most Thrilling Episodes of John Dillinger's life would have been opportunity to see Charlie Chan's Courage, one of four Fox Chans we'll not see again thanks to that disastrous warehouse fire a few years later that took out most of their pre-merger inventory. 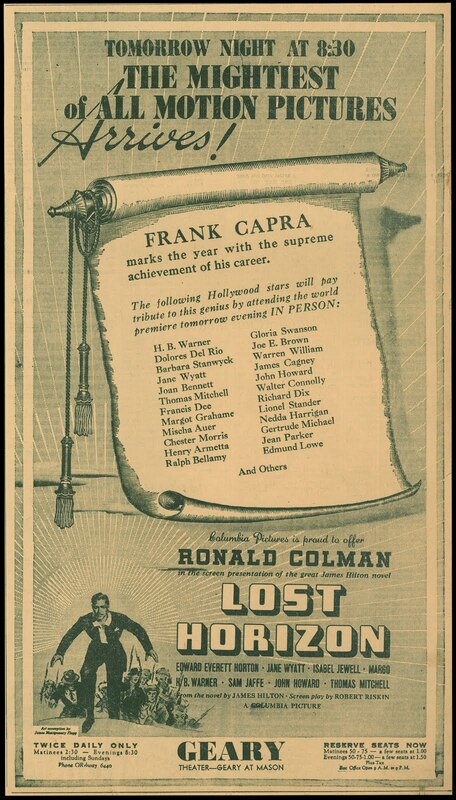 They say Frank Capra thought a lot of himself, and seeing this ad, I don't wonder. The occasion was Lost Horizon's two-a-day opening in San Francisco, and do note these advanced prices. Not many directors enjoyed this man's renown. It Happened One Night clocked record repeat bookings and wrote boxoffice history (was any comedy of the 30's more influential?). By 1937 and Lost Horizon, any Capra project was sure to draw a widest public, for his appeal reached all segments of the paying audience. Plush theatres used to routinely advertise big names expected to attend their opening nights. Not all of these would necessarily show up, but enough did to make for truly gala events. If nothing else, said crowd saw a longer version of Lost Horizon than we ever will. I've always had problems watching this show for the mess that is so much formerly lost footage patched in from inferior prints. Will you be at Cinevent for the entire weekend? I can only attend Saturday (to see the Louise Brooks film). Will you have a table or be at a specific location? Would like to be able to say hi again. I enjoy posts like this. It's like a triple bill of shorts rather than a feature. Don't wait for another trip to Cinecon for another! So in 1937, Lost Horizon was "The Mightiest of All Motion Pictures." Did it have to wait until 1954 to be dethroned by 20,000 Leagues Under the Sea, "The Mightiest Motion Picture of them All," or were there any mightier ones in between? If you want to feel more outrage, check out "Men of Tomorrow" by Gerald Jones. It's a very readable history of superheroes that details, among other things, how the creators of Superman were stripped of ownership early on and ended up in near-poverty until Warner came through with creators' credit and serious cash in '77 (to quiet an embarrassing campaign by other cartoonists on the eve of the big movie). In strange counterpoint, it also tells how the shrewd but almost comically sleazy Bob Kane secured a first-class ticket on the Batman gravy train for life. Today, of course, enlightened executives in all media respect and reward their content providers. Several Disney two-parters were sold as features abroad, while single episodes went out as "featurettes" (I suspect the "Arizona Sheepdog" referenced in the Crockett ad was one of these). Other projects planned for TV ended up going to theaters first, such as "Johnny Tremain". "The Man from Uncle" created movies by cutting, pasting and shooting bits of fresh footage (or shooting two-parters intended for that purpose); "Tammy and the Millionaire" was actually three episodes of short-lived sitcom and I think some of Roger Moore's "Saint" adventures made it to moderately big screens. Somewhere in the 60s, obviously repurposed TV seemed to vanish from the double features. You still saw movies based on TV shows, using the same people and sets (Munsters and Batman). And Universal had a knack for turning out movies that looked and felt exactly like TV shows, but weren't. A multitude of other series, especially expensive but short-lived projects like "Planet of the Apes", were pasted up into features for non-network stations, hungry cable channels and the growing video market. But pretty sure those never made it to any theater. Was there a point when actual TV-to-movies was put to rest? Thanks for sharing the M poster; would have been a much different movie if they'd shown Lorre doing that! O recently learned there was an American remake of "M" from the early 1950's, with David Wayne in the Peter Lorre role. You can find out about it at www. lileks.com, in the "Black & White World" section under "50's--Mid Century Morality"